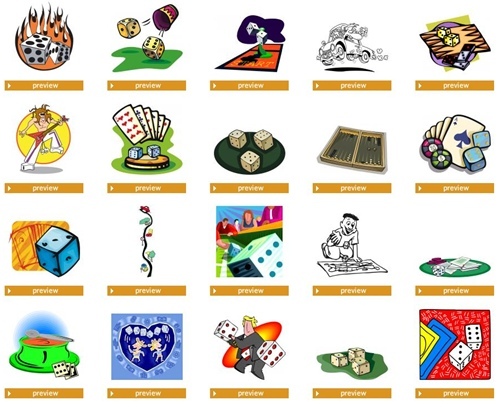 Good dice clip art adds polish and style to your work. Finding the right piece can be a challenge. Fear not, read on! I've found resources to help you get just the right clip art. While free is great, you should also always be careful what you download from "free" web sites. Less reputable sites may try to trick you into installing software called spyware or adware that harm your computer performance. I've seen it happen to friends, family and colleagues on a number of occasions. Besides the perils of downloading, there is limited selection on free sites. Your ideal piece of artwork can elude you. If you find yourself in this situation, sign up for an account to find plenty of dice clip art from a reputable web site like iClipArt or Clipart.com. You'll save time and expand the number of choices available to you. Many services allow you to sign up with weekly, monthly or yearly accounts too. That's a good way to keep your expenses down. If you need dice for an educational (non-commercial) project, you're in luck. Free clip art is available. The clip art found there is intended for teachers and educators and not for business or personal use. Please respect the license posted on their web site.